Sharing with other women and speaking out has been healing. – “But I don’t want to go among mad people,” Alice remarked. We know that under great stress, deprived of proper rest and nutrition, our immune systems are weakened. Our immune response is compromised as it struggles to recognize and respond to threats. In this weakened state we are more vulnerable to illness. Can a nation of people have a type of collective immune system? After 45 years of legalized abortion in the U.S., and close to 60 million procedures, there are few families that have not been directly impacted by the loss of a son or daughter, grandchild, sibling, nephew or niece. Millions of our fellow citizens have been complicit in the death of an unborn child; e.g., paid for the procedure, pressured or encouraged abortion, drove a friend to the abortion center. Thousands of medical and mental health professionals, educators and politicians have participated in direct ways in the death of the unborn. This is a shared national trauma. We know that individuals can suffer from depression, anxiety and other emotional and physical symptoms from traumatic loss. They are vulnerable to substance abuse and other forms of self-medication when they are denied the opportunity to work through their painful feelings and grieve their losses. These symptoms can leave women and men vulnerable to having poor boundaries and to exhibit impulsive self-destructive behaviors for a time in their intimate relationships, especially in the aftermath of the abortion event. What is the impact when an entire population of individuals, couples and families suffer from a shared national trauma? The continued unfolding of the Shockwaves of Abortion has left our families and communities, especially minority neighborhoods with high abortion rates, and children with emotional challenges and learning disabilities, vulnerable to exploitation. The rapid advance of transgender activism in the last few years may be just one warning sign that our culture’s immune system is seriously compromised. We have allowed a small minority of radical activists and their twisted ideology, assisted by powerful allies in entertainment and media, to infiltrate our communities, and our schools. Like the abortion rights revolutionaries, the transgendered movement is prepared to lie, manipulate information and language, and viciously attack anyone that dares challenge their agenda. They are eager to exploit and mutilate our vulnerable children to advance their radical cause. Like a compromised immune system, parents and educators, counselors and medical professionals find themselves, weak, defenseless, in denial of the threat, or promoting this madness. Dr. Kathleen “Kelly” Levinstein, PhD, is a Professor of Social Work at the University of Michigan, Flint. Her research and advocacy work includes human and civil rights violations against the autistic community. Walt Heyer is an author and public speaker with a passion for mentoring individuals whose lives have been torn apart by unnecessary gender-change surgery. He shares in an article in the Federalist of a custody battle that features a mother taking her 6 year old son down the dark road of gender transitioning that could lead to the boy’s chemical castration at age 8. The father says the boy acts fine with him and does not support this encouragement of the child transitioning. The mother took her ex-husband to court because he uses male pronouns when referring to the boy, (who the mother calls Luna) and takes his son to the barber for haircuts…when his hair gets long. There is another movement that promotes the mutilation and medical experimentation on vulnerable children. Planned Parenthood harvests the healthy organs of unborn little boys and girls torn from the womb of their mothers. More Cultural Chaos…or Recovery of Sanity? 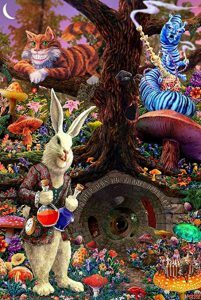 The further we are removed from our moral and spiritual Judeo-Christian heritage and the absolute providence of our Creator over human life, the further we travel with Alice down the rabbit hole into cultural chaos and madness. We need to protect our young people from transgender radicals. Like teacher Peter Vlaming, parents, educators, and community leaders need to stand up to these ideological bullies, whatever the costs, and protect their vulnerable children. An important step to restore sanity will be renewed commitment by our Churches, politicians and citizens to end this national trauma. We need to elect politicians that understand that abortion not only attacks the life of preborn children, it is eating away at the foundation of our society. Many of our fellow citizens would benefit from abortion recovery programs. Women and men are strengthened as spouses and parents when they open up their hearts and souls to repentance and healing of this deep wound. If we fail to confront the threats to our national immune system, we will see a nation that becomes increasingly irrational, divided, weak and vulnerable to internal and external attacks.